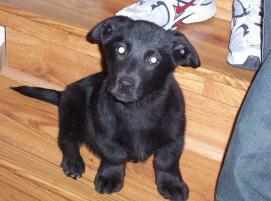 This is a picture of Chaco as a puppy. We got him from the pound in Salt Lake City using Petfinder. He was on the short listâ€¦ having already been at a different pound when born. That pound sent him to another one in hope of adoption. We saw him on Petfinder, doing a search for Corgi puppies. We already had 2 Corgi crosses and liked the short dog mixtures. We were out of state and did not think we would be able to get him, but rather than put him down, the girls at the shelter drove him to the airport, gave us a kennel and we got him a ticket to fly down to Albuquerque. It was amazing, at the beginning of the day he had a few hours left to live and no adoption possibilities and by the end of the day he was in our laps. Another cool fact was Chaco came from the same pound as the retriever, Casey, we adopted 15 years before. Casey had died about a year before and that is why we were looking for a new puppy! We got Chaco a year to the day that Casey passed away. Lots of coincidences! It was certainly meant to be. He was about 4 months when we got him. The cutest little bug ever. He loves everyone! He grew all of his Lab parts except legs and is so different looking, people always ask what he is. So we did a DNA test on him and he came out to be 75% lab and 23% Corgi and a touch of Westie. The Corgi part is obviously the short legs. The rest is all Lab. Chaco is about 2 now and has passed his training as a therapy dog. He goes to the school where we teach and brings smiles to everyone's faces. He loves to have kids all over him, rough or gentle. He does tricks for them like, roll over, speak, shake. He like the Special-Needs kids. Kids who rarely talk become animated around Chaco. Chaco likes young and old, male and female, and he could care less if you use a wheel chair, walker or crutches. He is only 2, and we look forward to many years of visiting schools, hospitals, nursing homes, etc. It is hard to believe he was hours from death. Chaco has certainly given us unconditional love and gives back to us on a daily basis. We could not have asked for a better boy!